With Labor Day here, the movement that created the holiday flexed its muscle in Seattle, where the landscape has been transformed in the last few years by labor-backed measures protecting and compensating people like in few other places across the country. The successes in historic strongholds like Seattle stand in contrast to the national picture. Right-to-work laws, anathema to unions, remain on the books in more than half the states. A U.S. Supreme Court decision this summer dealt a body blow to public-sector unions, drawing ire from Spokane union leaders. Across the nation, union membership rates are at all-time lows. AFL-CIO President Richard Trumka sees that tide turning. Seattle is no outlier, said the leader of the nation’s largest union federation in a telephone interview last week. 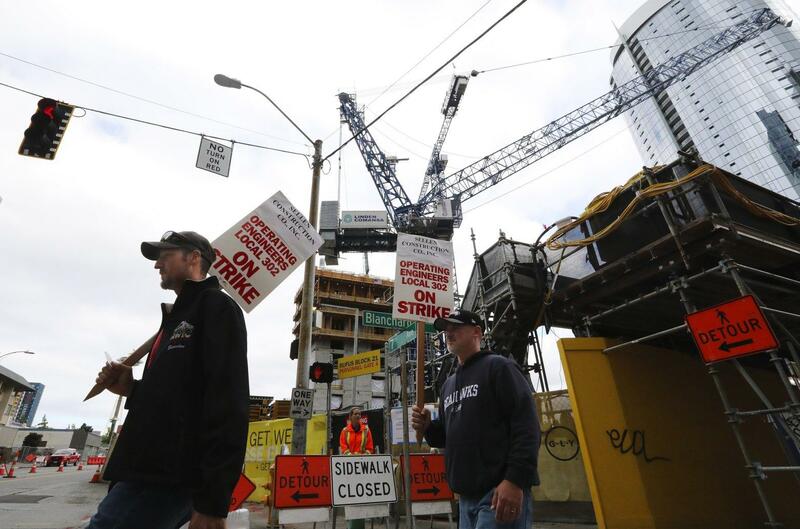 Late last week, equipment was moving again at several job sites where the union reached agreements with individual contractors, but as of Friday morning, the majority of Seattle cranes were still “put to bed” and no broader agreement had been reached. In the throes of a debate this spring over a new business tax on employee hours to fund housing and services in the face of an ongoing homelessness crisis, Amazon threatened to halt construction on one of those buildings and give up a lease on another if it passed. While many in labor backed the tax, the tone in the debate started to turn when a group of ironworkers folded their arms and chanted “No head tax,” drowning out Seattle City Councilmember Kshama Sawant’s attempt to hold a rally for the tax in front of the Amazon Spheres. It all makes for an irresistible visual metaphor for the complex, grinding battle between organized labor and corporate interests playing out in statehouses and courtrooms across the country, and in increasingly automated factories and the technology-enabled marketplaces of the gig economy. Indeed, Trumka said labor has its sights set on Amazon’s hundreds of thousands of warehouse employees. As much as it gathers power from its unity, “organized labor doesn’t speak with one political voice,” said Gregory, the UW professor. Those vocal ironworkers were on the same side of the head-tax battle as the business interests that have railed against a series of union-backed policies passed by Seattle lawmakers, including a $15-an-hour minimum wage, mandatory paid sick leave and secure scheduling rules. Indeed, some unionized hotel workers, whose contracts expired in May, have complained of wage compression since Seattle’s minimum wage began to rise and their own pay rates have not kept pace. Advocating for workers beyond its immediate ranks has earned organized labor, especially in Washington, “a reputation of being a guardian of the public good,” Gregory said. Nationally, support for organized labor stood at 62?percent, according to a Gallup poll conducted in early August. That’s the highest level measured since 2003. Unsurprisingly, there’s a stark partisan divide, with support among Republicans at 45 percent compared with 80 percent among Democrats. Overall union support has climbed steadily during the current economic expansion from an all-time low of 48 percent measured in 2009. Yet union membership has continued a steady downward march, from 20.1 percent of all wage and salary workers in 1983 to 10.7 percent in 2016 and 2017, according to the Bureau of Labor Statistics. Trumka touts the 262,000 net new union members added last year, noting that more than three-quarters of them were under 35. He describes a wave of organizing happening across the country, even in states with right-to-work laws, which prohibit mandatory union-dues payments and financially hamstring organized labor. He cited a membership drive during the last weekend of April that saw 1,000 nurses organized in Texas and 1,200 in Georgia. “Those people know more than most that the economy doesn’t work for them and they get taken advantage of,” he said. In Washington, the 2017 union membership rate was the third-highest in the country – trailing New York and Hawaii – at 18.8 percent, up 2 percentage points from its 2014 low. Beyond such strongholds, and even within them, unions remain on their heels. The Boeing Machinists union, traditionally the state’s most powerful, helped create Washington’s solid blue-collar middle-class. But after Boeing created a second assembly line in South Carolina, and the union was forced to give big concessions to assure assembly of the forthcoming 777X jet in Everett, the Machinists union has considerably less leverage and a contract that ensures no strikes through 2024. In the public sector – the part of the economy where unions are strongest, with a membership rate of 34.4 percent – unions now face fallout from the U.S. Supreme Court’s June decision in a case known as Janus, prohibiting public-sector employers from requiring workers to pay union dues. “In many places, unions are really struggling and are going to struggle a lot more after the Janus decision,” Gregory said. It’s already having repercussions in Washington state. In August, the state and one of its largest public employee unions, SEIU 775, which represents home caregivers paid by the public for helping Medicaid clients, stopped deducting union dues from some workers who had not signed up for membership or authorized deductions. The Freedom Foundation, which brought a class-action lawsuit challenging the practice, linked the change to the Supreme Court decision. “The unequivocal language in Janus only strengthened the case,” wrote Freedom Foundation labor policy director Maxford Nelsen in a recent blog post. He looked for a silver lining, suggesting that attention on the case contributed to the win at the Missouri ballot box, and struck a defiant tone. While tech-boom Seattle and Amazon’s urban headquarters make a fine backdrop for pickets and rallies, the biggest labor battles of the 21st century may yet be waged where the far greater portion of the company’s half-million-person workforce toils: its network of so-called fulfillment centers, the warehouses that U.S. union organizers have been eying for years but have so far failed to penetrate in a meaningful way. Some of Amazon’s European fulfillment centers are unionized. The company disclosed last spring a median annual pay of $28,466, including people in more than 50 countries and part-time workers. Perhaps girding for an organizing battle, the company – breaking its usual silence – rebutted similar assertions about warehouse working conditions when they were voiced by U.S. Sen. Bernie Sanders, I-Vt., last week. Trumka said the AFL-CIO’s Amazon strategy right now involves one-to-one conversations with warehouse workers to learn about their wants and needs. “When we get momentum, then we will go in to organize Amazon,” he said. Organizers in Amazon’s fulfillment centers will be confronted by another dynamic that is roiling 21st century labor: a growing number of robotic pickers, trolleys and other automated technologies working alongside people to speed the wares of the everything store into cardboard boxes and out to customers. Amazon’s cashierless Go convenience stores and growing numbers of self-checkout lanes at grocery stores are other examples of technology replacing jobs often held by union workers. Trumka said organized labor takes “very seriously” the potential job losses, displacement and worsening inequality that some economists see coming with broader adoption of automation technologies. He said the country is at a crossroads on this issue, even if it has been largely absent from the national political discussion. “The question becomes, how do we make sure the benefits of technology are shared throughout society, so you don’t continue to increase the rates of haves and have-nots?” said Trumka. Socialists and tech billionaires alike have proffered the idea of a universal basic income (UBI) as a potential solution to the challenges posed by automation, among others. Seattle was part of an experiment with this concept in the 1970s, when the federal government provided a guaranteed minimum income through income tax adjustments to about 2,400 randomly selected households. More recently, UBI experiments of various designs have been tried in places as diverse as Finland; Ontario, Canada, where it was discontinued one year into a planned three; and Stockton, California. Trumka said an AFL-CIO committee is examining UBI as part of a broader look at the future of work, but remains unconvinced. Last week on the picket line, construction workers expressed a similar sentiment. Published: Sept. 3, 2018, 10:30 a.m.